WooHooo! It's Friday! 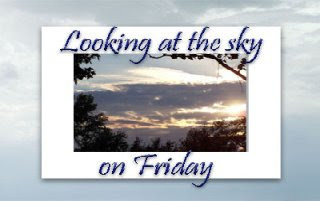 Not only is it the end of the work week for most people (not me, I've still got to work, but that's beside the point), it's also time for the fun and wonderful meme where we spend our time Looking at the Sky on Friday! My photo for this week was taken at the same time as my Looking at the Sky photo from last week was taken. However, I had this problem... I couldn't choose which one was my favorite, and since I claimed that last week's would probably be one of my top ten favorite sunset photos I've ever taken, well, that means I like this one quite a bit. Actually, now that I look at both of them, I think I like this one the best. No... wait... the other one is better. It sure is beautiful! Sometimes it's simply impossible to choose the best, isn't it? Tough choice...maybe we should flip a coin. We could just call it a tie, ya know. They are both amazing shots. 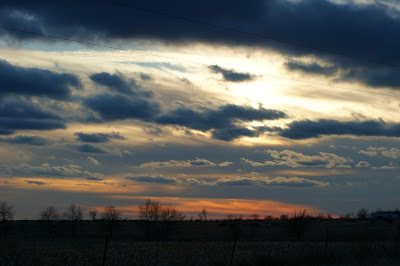 I love the contrast between the dark skies up top and the tiny hint of the orange hues in the bottom of the sky. Very nice shot(s)! I love the depth and colors in this! It's OK to love them both equally, right? I love this! I loved last week's too. I could never choose one over the other. I love both last week's and this one too ... but you do have dramatic skies in your part of the world! I participated at Happily Retired Gal and Sacred Ruminations on Friday but haven't had time to do any blog visiting for a few days. I'm doing what I can to catch up this evening after being away from home all day.